Do you know the purpose of the Tabernacle in the Old Testament, or that the earthly one was a copy of the Heavenly one? There are many wonderful promises that the Tabernacle gives us and it points us to all that we have in Jesus Christ. For example, the bread of presence and the Bread of Life, the lampstand and the Light of the World, and the mercy seat and the Cross of Christ. All the colors, materials, measurements and procedures are symbols of God’s promise of reconciliation and they provide us with a picture of how God is making good on His promise. 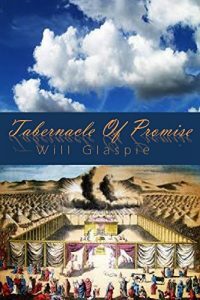 In this book ‘Tabernacle of Promise’, Administrative Pastor Will Glaspie of Calvary Chapel Chico shares the meaning behind the Tabernacle and it’s symbols from the Old Testament to the New Testament. If you have ever wanted to study or learn about the Tabernacle then this is the book for you as it will walk you through why it is in the Bible and how it points us to Jesus Christ and the many promises we have as Christians. And, don’t forget that by studying the Tabernacle, we get a glimpse of what Heaven will be like as the real Tabernacle in Heaven is going to be even more spectacular. Tagged Book, Promises, Tabernacle, Will Glaspie.